← Manhattan blognic is UNDERWAY! In the brick by brick file…. Vatican City, Apr 6, 2010 / 05:53 am (CNA/EWTN News).- This morning the Holy Father appointed current San Antonio Archbishop Jose H. Gomez as Coadjutor Archbishop of Los Angeles, California, the largest diocese in the United States. The prelate will serve alongside current Cardinal Roger Mahoney, and will take over his position when he retires. The prelate earned bachelor’s degrees in accounting, philosophy and theology and was ordained an Opus Dei priest in 1978. In 1980, he obtained a doctorate in theology from the University of Navarre’s Pamplona, Spain campus. From 1987 to 1999, then-Father Gomez was in residence at Our Lady of Grace Catholic Church in San Antonio where he assisted with the parish’s pastoral work. It was during this time that he became a regional representative to the National Association of Hispanic Priests (ANSH). In 1995 he was named president, then took on the role of executive director in 1999. 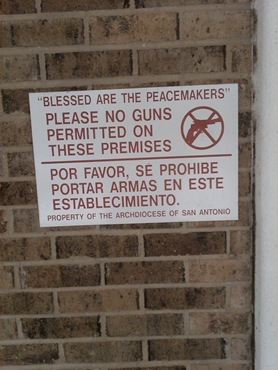 While the Archbishop of San Antonio, Most Rev. Gomez created the The Catholic Community Foundation for the Roman Catholic Church of the archdiocese and was key in bringing together Hispanic leaders for the Catholic Association of Latino Leaders (CALL). Archbishop Gomez was also appointed in 2008 as a consultant to the Pontifical Commission for Latin America. He also serves in various roles for the United States Catholic Conference of Bishops including: chair of the task force on the Spanish Language Bible for the Church in America, chair of the Committee on Cultural Diversity in the Church, member of the Committee on Doctrine, and member of the Subcommittee on Hispanics and the Liturgy. According to the Archdiocese of Los Angeles, in his new role, Archbishop Gomez will lead 4,329,267 Catholics (as of 2005), 530 diocesan priests, 640 religious priests, and 1,710 religious sisters. The news coincides with things I have heard for a few months. I picked up the image, above, at Sancte Pater. I am pretty sure that this is not a "win" for Card. Mahony. This entry was posted in Brick by Brick and tagged Archbp. Jose Gomez, Card. Mahony, San Antonio. Bookmark the permalink. 112 Responses to ALERT: Successor in Los Angeles! He will need every fire department in LA to clean out the Augean Stables. A commentator at NCR from +Gomez’ former diocese of San Antonio has already warned of the lace, liturgical uniformity, and funding for seminaries that is about to descend upon the Angelic city…in other words, Deo Gratias! I can’t wait to see how things will change at the 2012 Religious Education Conference in Los Angeles. Los Angeles sure needs a breath of fresh air! God bless the Archbishop! Rejoice, O Mother Church! TNCath — that was my first thought, as well. Can’t wait to see that Pagan mosh pit busted up. To God be the glory for Pope Benedict and Our Lady of Guadalupe! what does that mean practically? Does that mean that +Mahoney will be able to limit +Gomez’ power/authority long in to the future? Thank you, Holy Father, for appointing a Catholic archbishop to lead our country’s largest archdiocese! Tu es Petrus! A Coadjutor bishops assists the bishop much as an Auxiliary bishop does, but unlike an Auxiliary bishop he has right of succession. That is, as soon as Cardinal Mahony submits his mandatory letter of resignation in Feb. 2010, Bishop Gomez automatically and immediately becomes Archbishop of Los Angeles. As soon as Cardinal Mahony retires, he will have no more authority over the archdiocese and will be unable to impede Archbishop Gomez’s power or authority (unless he tries to sabotage him by speaking up and saying things he shouldn’t say). A coadjutor bishop is more than a simple auxiliary bishop and less than the diocesan bishop himself. He is the diocese’s second-in-command after the diocesan bishop, who remains the ordinary. But, depending on the terms of the appointment, some of the diocesan bishop’s powers may be transferred to the coadjutor, to the point that the ordinary may become a mere figurehead. Most importantly, the coadjutor bishop has the RIGHT OF SUCCESSION. That is the main difference between an auxiliary bishop and a coadjutor. Auxiliary bishops, of course, don’t have the right of succession. When the diocesan bishop dies or resigns, none of the auxiliary bishops suceed as diocesan bishop. Instead, the See becomes vacant and an appointment is made by the Pope. On the other hand, when the Pope appoints a coadjutor – which is rare – he is laying the ground, preparing the succession. The two prelates – the ordinary and his coadjutor work side by side, the ordinary remaining the leader, but when the ordinary (the diocesan bishop) dies or resigns the coadjutor AUTOMATICALLY succeeds him, instead of the See becoming vacant. According to a press release by the Archdiocese of Los Angeles, Card. Mahoney will stand down as Archbishop of Los Angeles, and will be succeeded by his coadjutor, on February 27th, 2011, when Card. Mahoney turns 75, which means that, according to the Archdiocesan press release, the Cardinal’s resignation is going to be accepted on the same day that it is made. Interesting to compare the two. Cardinal Mahony has degrees in social work. ++Gomez has degrees in philosophy and theology (and oddly, accounting). Oh, thanks be to God! Mahony’s reign is ending! Is that picture of the Holy Father driving an earthmover Vincenzo’s work? If it is, it fits perfectly! As Mike stated above, it WILL take the LAFD to clean out that Augean stable! I hope that the Archbishop-elect will put his foot down and CANCEL that travesty called ‘A Religious Education Congress’! The nerve of that man, Benedict XVI, appointing a Catholic archbishop to LA? Who does he think he is, the Pope? Oh, I guess he is. Congrats to the people of LA. Too bad, so sad, NCR and “Sister” Chittester, “Father” McBrien, etal. Life is hell. I guess you guys need to work harder with your secular collaborators to harm the Church. As a Hispanic-American I was moved to tears to read about the designation of Archbishop Gómez as Coadjutor of LA. This is a great day for the Church in the USA for many reasons, and especially for Latin-American Catholic immigrants to this country. I know I am putting the cart before the horse in mentioning this, but Archbishop Gómez will most likely become the first ever Hispanic-American Cardinal, even if this is a couple of years down the road. The fact that he was named Coadjutor and is not immediately succeeding Mahony is quite an advantage I think. He will have almost a year to organize himself and get a better footing and sense for what his priorities will be as Mahony’s successor. He will be even more prepared to confront the onslought or resistance, defiance, and nastiness that he will inevitably face by the old guard which will remain entrenched there for a while – but I think we are witnessing the very first steps of the genuine renewal of this great Archdiocese with this nomination. Que Cristo Resuscitado guíe el camino de Su Excelencia Reverendísima! This may not be a win for the ordinary, but it’s a big win for the archdiocese. Abp. Gomez is a very holy man who faces daunting tasks. Cardinal Mahoney knows which way the wind is blowing. It would surprise me if he, unlike Cardinal Bernardin, put up much resistance to the new man. I wonder where the Religious Education Congress will end up next? Which diocese or archdiocese will host the Cirque de So-Lame? Or, will it stay in LA and only permit authentic Catholic presenters and workshops? What I like about this appointment is that it may well silence the claims in the news and in the blogosphere that our Holy Father wishes to stem the tide of some kind of perceived Opus Dei power grab. I think that if more priests tried to follow the encouragement of St. Josemaria, we would have a holier presbyterate! We in Arizona are usually strongly influenced by what happens in California. I hope it stays true in this case. Two of the largest dioceses in the west, Phoenix and LA, were recently bastions of disidence under liberal bishops. Now, by the grace of God and the wisdom of the Vicar of Christ, they are lead by Catholic men! In the words of Father Z, brick by brick!! If the theatre of the absurb remains in L.A. but becomes something consistent with liturgical norms look to the neighboring Diocese of Orange to take over the joke that has been labeled the “religios education conference”. Not so odd if you understand the background. All priests of Opus Dei have first worked as laymen in their professions (law, military, physics, whatever) for a number of years before being called to the priesthood. Along with being very orthodox, they usually bring a very grounded, real-world perspective to their priestly ministry. The screaming you hear from LA isn’t the Tidings office, it’s me in rejoicing! Deo Gratias! There’s much rejoicing in this Los Angeles household this morning. Christ has sent us a great champion of faith in Benedict XVI! Contrary to what some commenters here have alleged, there are MANY orthodox Catholics living in Southern California, and we’ve been waiting for a new shepherd for a very, very long time. The American Papist blog is giving Gomez mixed reviews. Apparently there is a fair amount of liturgical shenanigans in San Antonio accoding to some posts. FIWW (?) is referenced by some posts as an SA group which is critical of the liturgical situation in SA. Other posts there say Gomex is unfriendly to the EF and has been critical of it. Don’t know if this is all true. But one thing – several posts at the AP blog said the Vatican assured Mahoneey it would follow his request and apoint an Hispanic and not regressive. The big hope among conservativ Catholics had been that Olmstead would get the nod didn’t happen. That AP prediction seems to have come true. Looks to me that Gomez is a moderate “compromise” choice for LA. Rorate quotes Una Voce to claim that Gómez is a friend of tradition. Such a shame he gets stuck with that cathedral, but the Church is blessed indeed. God bless our pope! This sounds like a good pick. Archbishop Gomez seems like the kind of guy who’s tough enough not to mind digging into a big job, and he also seems personable enough not to make his job harder than necessary. Also, I suspect the accounting will come in handy. Funny how nobody is praising the new Archbishop-to-be for being a “sensitive Latino”. Some people only want minorities to be appointed when conveeeeeenient. Re: Mahoney, I think it’s a shame he wasn’t left to do good works in a lower position. He’s just way too persuadable that feeding souls and worshipping God in God’s way doesn’t matter as much as feeding bodies. Maybe in retirement he can do more of what he’s good at. Oh, I’m sorry. It was “wise Latina” that was the stereotype we were supposed to bow to. Oh, and I’m sorry for the folks in San Antonio. That’s rough, to have a guy you like and have him taken away again. Not something that would usually happen, in such a huge archdiocese. I heard Archbishop Gomez give a talk at a conference in Denver a few years back. . .he had just been appt. to S.A. The topic: Eucharistic spirituality for the laity. Very orthodox, almost entirely Tridentine in flavor; no wish-washy nonsense about the pre/post Vatican Two Church. I don’t know anything about his liturgical allegiances, but his sacramental theology is solid. As a denizen of L.A., I say WOOOOOOOOHOOOOOOOO! It would be nice if we could get an FSSP or ICKSP parish in this area. I’m so grateful for the Norbertines of St. Michael’s Abbey, who say the TLM in parishes all over southern California, but it would be even nicer to have a parish that’s completely devoted to the older form; that way everything is all set up for it. When is +Mahoney expected to retire and step aside? I don’t see that in the releases. Deo Gratias. We live in Los Angeles in one of the few orthodox oases here – it is exciting to think that we might actually get to push back the desert. An Opus Dei priest heading the Archdiocese of Los Angeles… we can all rest easy! I am in the Diocese of Monterey, so Archbishop Gomez will be my new metropolitan archbishop. Many of Cardinal Mahoney’s liturgical “directives” were embraced in my diocese… I hope that happens with the new archbishop. Dei gratias! Laudetur Iesus Christus! The American Papist blog is giving Gomez mixed reviews. Someone might be trying to throw cold water on the good news. Certain traditionalists see Opus Dei as tools of Vatican II. As you can see, it is predicted in that official press release of the Archdiocese of Los Angeles that Mahoney will step down and be succeeded by Gómez exactly on the day of the Cardinal’s 75th birthday. In other words, they predict (or imply an arrangement according to which) the Cardinal’s resignation will be accepted as soon as it is formalized, so that Mahoney will retire precisely on his 75th birthday and be succeeded by his coadjutor. Also, it seems that the appointment of coadjutors has always been very rare in America. So it is easy to figure out that, since the appointment is being made now, the extraordinary circumnstance of having an Archdiocese with two Archbishops (the diocesan bishop and his coadjutor) is not intended to last for long, precluding any extension of the Cardinal’s tenure past the canonical retirement age. Ergo the firm statement of the press release to the effect that the transition will be complete by February 2011. As you can see, it is predicted in that official press release of the Archdiocese of Los Angeles that Mahoney will step down and be succeeded by Gómez exactly on the day of the Cardinal’s 75th birthday. Anyone else entertaining a vision of movers hanging around the parish office waiting for the clock to strike 12:01? I read that the result of Card. Mahoney’s 25 year leadership of the See of Los Angeles is: a federal grand jury investigation on the handling of the sexual abuse cases (the only known case of a grand jury investigating the Church conduct of the paedophilia crisis), and a record 660 million settlement for about 500 claims of sexual abuse. Add to that the liturgical abominations and you see that the Cardinal’s retirement is long overdue. It is a pity that he wasn’t deposed from his See and from the Sacred College. Given the normal praxis of the Holy See of not having two Cardinal electors from the same See at once, that means that Archbishop Gómes won’t be eligible for a red hat before Mahoney turns 80 in 2016. In fact, Gomez was one of the few who went to such lengths to support the Holy Father.I’ve posted more on this over at my site. You know, it doesn’t take a whole lot of digging to find out that Gomez has in fact been hugely supportive of the EF. That some people criticize Gomez because he doesn’t share their own pastoral strategy is to be expected. But let’s not make things up. I agree with Scott W.–some people are trying to throw cold water on what is clearly a huge moment for the “reform of the reform”. And, please, let’s do our homework and not make baseless charges against holy bishops. We’ve had enough of that, I believe. This appointment is absolute genius. The liberals won’t be able to oppose a Hispanic bishop, when 70% of Catholics there are of Latin American ancestry. It seems a good choice. The percentage of Latinos is so high in southern California and many are losign the faith; this perhps will help. I would not be surgprised to see the FSSP or similar invoted to the archdiocese. I know from friends how difficult it is to find an orthodox parish or a place to adore Jesus in the Blessed Sacrament. It has been a long long time in the darkness. As to the ‘religious diseducation’ conference, I would suspect that many things will be set in place before Abp. Gomez takes the reigns but he might not put up with the pagan ritual dancing and some of the other nonsense. The present cardinal has been called the teflon cardinal as no one can makes the numerous charges stick to him. It will take more than a generation to undo what has been done? Well, Abp. Gomez has a few years to give. We need to pray for him for it is a monumental task and will take great holiness and strength on his part. Dauphin, it’s also a good choice because Gomez has a pretty solid background when it comes to helping the impoverished. The liberals won’t be able to complain about him on that front… so, if they want to complain, they’ll have to actually argue doctrine rather than trying to paint Gomez as the bad guy on other grounds. Archbishop Chaput, under whom Archbishop Gomez served as an auxiliary in Denver, lauds this as the “perfect choice” by the Holy Father. Opus Dei members accept Vatican II simply because it was a legitimate council. As for each document, and each line of each document, well, opinions there run the gamut. As well it should, for there is a legitimate freedom working here. Priests of the Work are ardent, holy, learned, and practical. They follow the rubrics precisely. They love the sacrament of Confession; Our Lady, the Rosary, Benediction, and bringing souls to Christ 24/7. Gomez won’t please everyone; I’m sure he already knows that’s impossible. There’s ONE person he has to please, though, and His Vicar. Love the picture of our Holy Father driving the bulldozer. He’s gonna need a great big push blade on that thing. LarryD, Cirque de So-Lame. ROFL!! That’s a keeper! Given Cardinal Mahony’s overwhelming emphasis on ministry to Mexicans/Hispanics, I would not presume that Gomez’s appointment is unwelcome to him. Remember that Mahony had control of the terna – it is highly likely that Gomez was one of his candidates, perhaps even his preferred one. Mahony’s Anglo number one fans may be crying their eyes out, but probably not Mahony himself. Let’s not forget Bishop Nicholas DiMarzio is also Opus Dei and is far from a friend of the traditional Latin Mass. (For details, ask anyone who used to attend Opus Mariae in the Diocese of Camden until he shut it down and threw them out.) Thanksfully the faithful prevailed with Mater Ecclessiae in Berlin, N.J., but it is a safe statement to say the bishop was a problem every step of the way. So, there is reason for suspicion when it comes to Opus Dei bishops. With respect to Gomez, on his first day on the job he should put a big picture of James Cardinal McIntyre up in his office and work as hard as possible to be even a fraction as effective as that great and holy archbishop of Los Angeles. jarthurcrank – With all due respect, I think Cardinal Mahony salt and peppered and then ate his biretta with the news of this appointment. He may be relieved that at least his passion for immigrant outreach and pastoral ministry will find continuity with his successor, but we have to remember that his other passion was experimental, illicit, and confrontational liturgical celebrations… do we really need to recall Gather Faithfully Together and the Mother Angelica persecution he spearheaded? He did not have control over the terna, he had the ability to advise the Nuncio and the Congregation for Bishops as to his preferred choice, which he did, and Gómez was not among them – as Fr. Z wrote in the thread, I also deeply suspect that this was not a win for Roger Cardinal Mahony. His pick would have been Bishop Soto of Sacramento… that would have been the “right kind” of hispanic (ultimately a friend of liberal catholicism and a protégé of Mahony’s) for the job… Archbishop José Gómez is a loyal son of Opus Dei, and I suspect that what first flashed across Cardinal Mahony’s eyes is what is flashing all across the media about this appointment “OPUS DEI BISHOP NAMED ARCHBISHOP LOS ANGELES” … no, this is not a win for the good Cardinal, this is at best lesson in humility for him from the Bishop of Rome. 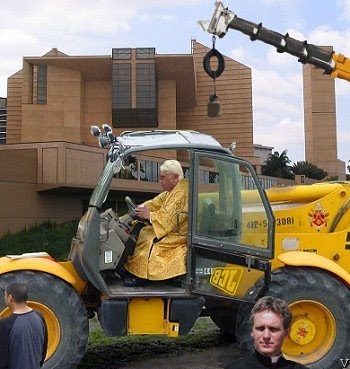 That photo of Pope Benedict ready to wreck the new LA Cathedral is too hilarious for words. However, most people may not know that it is so solidly built, a priest in LA told me it could withstand a low grade nuclear detonation. The technology used in its foundations also makes it practically earthquake proof. If it doesn’t serve much for Catholic worship, at least one could say it makes a great bomb shelter. A blessing for Los Angeles and California. Archishop Gomez has been more than kind and open to the traditional and Anglican use communities in San Antonio. In his time as auxiliary in Denver and then moving back to San Antonio, many vocations have followed. Pray the first purge will be St. Johns Seminary. Pray also for the Holy Father to send up more good men like Archbishop Gomez especially to the diocese of Fresno. Although the reign of Cardinal Mahony’s terror ends on shaky grounds, the concrete cathedral is built on rollers and actually stood its ground during the recent California earthquake, unlike the cardinal defending the faith. As Fr. Z has pointed out in the past there is a smaller version of the cathedral in Bakersfield, Ca. The Kern County Juvenile Justice Facility (juvenile hall and court)is built along the same lines as the cathedral. To look at juvenile hall then drive to Los Angeles and look at the concrete cathedral is sad and laughable. Not to ruin everyone’s party but an Archbishop also needs the support of his faithful. And unfortunately allot of his faithful is all charismatic, thanks to + Mahony. So don’t expect miracles to happen. The laity who run the Religious Education Conference and the Liturgical Dance committees have a allot of power in the archdiocese. Probably even more than +Gomez will have. Because unfortunately money talks in the Catholic world. Born and raised in So-Cal, in the heart of the LA Archdiocese. Most parishes have some adoration (at least Fridays) and there is more than one in driving distance of my home that has perpetual adoration. Further there has been, at least since the very early 90’s, traditional Latin Masses…granted on a circuit, which is annoying. But now there are such within driving distance every Sunday in most of the diocese, and in the more “liberal” Ventura area, two every Sunday, and at one place every day. I disagree that Opus Dei priests, “accept Vatican II simply because it was a legitimate council.” Having Opus priests as friends and being a priest who attends a yearly Opus retreat for priests, I would say their loyalty to Vatican II goes beyond its canonical legitimacy. They embrace the Council as the work of the Holy Spirit and as a ratifying of St. Josemaria’s theology of the role of the laity in the Church and in the world. This is what gets the Opus in trouble with hard care traditionalists, who enjoy screaming nagfests about all things Vatican II, and pray for the mythical day that the Council is “wiped and blotted” from memory as a huge, sorry mistake. The Opus spirituality, while thoroughly Catholic, encourages the laity to embrace the real teachings of the Council, while opposing its so-called “spirit.” This is why they are sadly decried as “Vatican II moles”. The Opus priests are, in other words, criticized for encouraging Catholics to “bloom where they are planted” instead of fleeing their parishes for traditionalist enclaves. In that light, while Archbishop Gomez welcomes the celebration of the EF Mass, he will not be an active apostle for it. He is quite content to offer the OF and sees the possibilities of “mutual enrichment” of the two rites. This is a very Hispanic attitude–to support the OF primarily while making use of the heritage of the EF Mass to celebrate the OF Mass the way it should be celebrated. One comment for Becket1 – the problem isn’t that many of the faithful is charismatic, but that they aren’t as faithful as they should be. There are charismatic communities who are very orthodox, just as there are wacky ones. From the writings of St. Josemaria and other literature, the charism of “Opus Dei” was not only prior to VII but also was not in “line” with the “spirit of VII” (an evil spirit?). This movement or charism does not “fit into” any particular “niche” and if I dare to say, does not in any way mirror the LC/RC, which is undergoing a real purification/discernment/questioning. I have some acquaintance with OD from a distance; but it is definitely not just an adherence in “white-knuckled” obedience to VII; it embraces the authentic interpretation (hermeneutic of continuity) of VII. There may be some problems, in some places, but overall, this spirituality and mission is a definite gift to the Church. Good for my native archdiocese! Playtime is OVAH. Fr. Sotelo: If Abp. Gomez isn’t an active apostle for the E.F., but welcomes it and won’t try to impede it in any way, that seems to me good enough. And in an age when priests don’t need the bishop’s permission to offer the E.F. Mass, that ought to be good enough for all who love the E.F.
Fr. Sotelo–yes, your’re right to refine my comment. I guess I meant that from my experience, a priest of Work sees the Council as Benedict sees it, ie, it’s legit, let’s work with it in the light of Tradition. You’re also correct about the Universal Call to Holiness, that is core teaching in the Work, and VII. Definitely right about the “spirit of VII”–no priest I have ever met in the Work has anything to do with that caricature. I do think, as much as I admire and like the EF, one’s holiness is life is not dependent on the level of one’s interest in lectionaries, missals, rubrics, etc. This is NOT to discount the vital importance of these things, but to say the universal call to holiness is for EVERYONE, not just bloggers who can read Latin (as much as I may admire these guys). Blaming VII for everything that followed is a horrid fallacy that Opus Dei helps correct, in my experience. Fr. Sotelo is correct as usual. Vatican II is part of the Church. However, when you hear words such as “in the spirit of”………RUN. Los Angeles was originally named “El Pueblo de Nuestra Señora la Reina de los Angeles del Río de Porciúncula,” or “The Village of Our Lady, the Queen of the Angels of the river of Porziúncola.” So, rightly, it’s not the City of the Angels, but the City of Our Lady, Queen of the Angels. And I think, for a change, she’s smiling today. The theology of the universal call to holiness predates Vat II and Opus Dei. Fr Garrigou-LaGrange was writing on it back in the 1930’s and Fr Arintero even earlier at the turn of the century. There is little doubt that the spirituality of the Church was clericalized in the 16th century. Unlike the medieval orders, almost none of the new orders (e.g., Jesuits) had branches of sisters or of the laity. Further, the US lacked cathedral canons, which meant no opportunity for the laity to go to Vespers. That having been said, Opus Dei is unique, turning the worker-priest movement upside down. Instead of clerics having secular jobs, Opus Dei numeraries have secular occupations but live as in a religious community. Robtbrown–yes, quite right, though Escriva was trying to live it from 1928 on, and was thought a heretic by some for his “strange” ideas. LaGrange has a lot of esteem from my friends in the Work. I would say that single members of the Work living in Centers certainly don’t see themselves as living as a religious community. Intense prayer, yes, but they don’t take vows, are immersed in the world, and so forth. I wonder if the proper way to demolition an aesthetically disastrous cathedral is by using holy hand grenades? Re Latin: When I was at the Angelicum, the secretary to the Dean of Theology was an Italian woman who had attended a Classical high school (liceo). She could read Latin, but probably half the clerical students enrolled (excluding Italians) could not. I wholeheartedly agree that the Opus is not a novel spirituality. As Dr. Brown points out, there were, before Vatican II, currents of it in the writings of Dominican Frs. Garrigou-LaGrange and Arintero. If I’m not mistaken, I believe this had a big effect on Fr. Jordan Aumann, OP, whose “Theology of Christian Perfection” was studied in many seminaries before Vatican II. I always enjoyed Fr. Aumann’s book, which in some aspects I found more helpful than Tanquerey’s work on Ascetical-Mystical Theology. Jacob: “Of course, a direct hit would vaporize the entire thing… :D” is another comment that almost made me cough up my coffee. Tooooo funny. Although, I am sympathetic to the building staying put, since it did, after all, cost 200 million. Waste not want not. Robtbrown—yes, quite right, though Escriva was trying to live it from 1928 on, and was thought a heretic by some for his “strange” ideas. LaGrange has a lot of esteem from my friends in the Work. Fr Garrigou also had problems. I once found a review of The Three Ages that accompanied its publishing. The book was panned. And Garrigou used to fight with the Cong of Saints who wanted nothing to do with some of the laity who process he was proposing. BTW, Fr LaGrange usually refers to Marie Joseph op, the founder of L’Ecole Biblique in Jerusalem. I would say that single members of the Work living in Centers certainly don’t see themselves as living as a religious community. Intense prayer, yes, but they don’t take vows, are immersed in the world, and so forth. I never said they take vows. But Numeraries are celibate, live in OD centers, and generally devote their incomes to Opus Dei. And they still don’t see themselves (because they aren’t!) as religious. This was a huge part of the reason the Work needed to find it’s proper place in the Church canonically– prior to the personal prelature, all the existing structures did attempt to categorize the members as religious in some fashion or another, which is totally contrary to the spirituality of Opus Dei. The whole point is that lay people, secular people, can be live “normal” lives out in the middle of the world, working, raising families (the supernumeraries,) active in their local communities, etc. etc. yet still be striving for heroic sanctity and living a contemplative life right in the middle of it all. Sorry. Don’t want to drag this discussion too far afield. I’ve been hoping for Abp. Gomez ever since the co-adjutor rumors started flying, and I think he has his work cut out for him (no pun intended) in Los Angeles. Fr Sotelo: As a part of my Master’s Program, I read and studied Fr. Aumann’s “Christian Spirituality”, as well as G-G-LaGrange’s work; these Dominicans have a particular contribution to the “universal call to holiness” and as a part of our Public Association of Faithful’s charism of contributing to the holiness of the Church by forming “contemplatives in the world”, priests and laity, along with our monastic community, that forms the “heart” of our association, we are in particular debt to these “pioneers of the spirit” in this age, along with Pope John Paul II, Hans Urs von Balthasar, Adrienne von Speyr, and Pope Benedict XVI. It is truly the “hermeneutic of continuity”…not something stagnate nor “too cool:<)”, but rooted in the Sacred Tradition always seeking authentic “new forms” in order to bring Christ to the world. Please pray for us. If memory serves, Fr Aumann studied in Salamanca although Fr Arintero was no longer alive. Salamanca was a very important center of theological study, in that of St Thomas. Fr Aumann also translated the Arintero magnum opus “Mystical Evolution”, though I doubt you need the translation. Although the concept of the universal call to holiness precedes the founder of Opus Dei, I definitely think Opus Dei is unique. Also: The work by Tanquerey is typical of the period. Much emphasis on structure, and positing the call to contemplation very late. robtbrown: I have used Tanquerey with much benefit in my classes with seminarians and our consecrated laity. The “universal call to holiness” is, unfortunately, the “best kept secret” of ‘Lumen gentium’…thanks to the “spirit of VII”, which made “chancel prancing” by every single life-form the rule, rather than being holy in ones’ particular state of life; not to mention the CTA folks/VOTP/SNAP/et. al…we’ve gotta a lot of work to do…yeah? I’ll offer condolences to San Antonio’s Catholics, I’m sure LA is getting the better of this transfer. He’s Latino and not of the liberal persuasion. I did a quicky check on liturgical abuse in SA and didn’t see anything after his taking over that see (which doesn’t mean it didn’t happen, only that it wasn’t a top Google selection). So it looks like not only does he have a Hispanic background, he’s got a good Catholic theological view. He may lack some of Mahoney’s people pleasing abilities but I’m not certain that Bp. Mahoney knew how to use his charisma properly anyway. Central Catholic is the juvenile justice facility the one near (in front of) KMC? I went in there onceand it wasn’t impressive as a justice facilty either. (I wasn’t actually a party involved in the case but my lawyer had taken on clients that were working against my best interests and I wanted to see what he’d do if I showed up: He never told the court about his conflict of interest. Since our new Archbishop likes to pray before the Blessed Sacrament, his first challenge will be to actually locate it in the cathedral. It is so well hidden most people pass right by without knowing it’s there, and the tabernacle is so ugly you can almost hear Christ crying to be released. Hopefully relocating the tabernacle to a place of prominence, in something worthy of our Savior, will be his first renovation of the “Taj Mahony”. And they still don’t see themselves (because they aren’t!) as religious. I never said they were. I compared certain parts of the lives of numeraries to the religious life. This was a huge part of the reason the Work needed to find it’s proper place in the Church canonically—prior to the personal prelature, all the existing structures did attempt to categorize the members as religious in some fashion or another, which is totally contrary to the spirituality of Opus Dei. Actually, there was precedence in the Middle Ages. The Dominican sisters (not nuns) began as Third Order members (often widows) deciding to live in community. The whole point is that lay people, secular people, can be live “normal” lives out in the middle of the world, working, raising families (the supernumeraries,) active in their local communities, etc. etc. yet still be striving for heroic sanctity and living a contemplative life right in the middle of it all. The Archbishop was openly critical of Nancy Pelosi’s catechetical instruction to the nation and rightly so. I wonder how the first meeting of the Archbishop and the mayor of LA will go. Will the mayor show up solo or with his concubines in tow? Will the Sanchez sisters and all the pro-abort politicians cardinal Mahony would never address greet him with open arms? Imagine what good things may now come out of the annual religous education congress, also known as the three days of darkness. Pray hard for the new Archbishop, he will need it to clean up after Roger. rinkevichjm. Yes, the jsutice center is next to KMC. It has simialr concrete slabs placed together like the concrete cathedral. Both are ugly. robtbrown: I find “A Heart to Know Thee” by Eugene Cuskelly to have substance, depth and relevance. Joshua 08: one of the nearest parishes (St Ann’s in Ridgecrest) to Death Valley has perpetual adoration (Barstow’s St Joesph and its two missions (Trona & Baker) don’t have perpetual adoration). And theoretically, it is in driving distance from every place in Los Angeles (it’s only ~140 miles from LAX). Of course , it is only one of three (last I knew) in the Fresno Diocese. We also have perpetual adoration at our church, St. Therese, in Alhambra, CA, just minutes from downtown Los Angeles. That is key, and what we need more of in the Church. I pray +Gomez doesn’t get burned out. It’s tough being the “boss” sometimes….especially when it’s an uphill battle the whole way. It’s easy for us to be armchair-“Bishops” at times, but we forget the awesome responsibility these men have. I shudder to think of Dante’s comment that the floor of the lowest levels of Hell are lined with the skulls of unfaithful Bishops. I’ll stick to my layman’s job. God Bless the Archbishop! When do we get a similar archbishop here in Manila? Our cardinal-archbishop is waay beyond the canonical retirement age but he was asked by the Holy Father to stay until the cardinal probably turns 80! Our archbishop is rabidly anti-tradition and therefore anti EF! Because Anscar Chupungco runs the liturgical show here in the Philippines. Prayers for Archbishop Gomez for the daunting “house cleaning” ahead. Prayers for San Antonio that the faithful be blessed with a similarly holy bishop. Prayers for the Holy Father…and thanks to the Lord for giving us Benedict XVI. Ad Multos Annos! SonofMonica’s description of a “Pagan Mosh Pit” is the cleverest adjective I’ve read to describe the structure. His Holiness is riding some kind of glorified wrecking ball machine. So much for reverent de-consecration of a Church. I wonder if the liturgical dancers are still in the building while he’s busting it up. Something about the walls of Jericho tumbling down ……. I hope he’s able to live up to half of the expectations of the people on this blog. Wouldn’t it be more rubrically appropriate for the Holy Father to be wearing a Cope while driving a bulldozer? Hooray! Best news in several weeks. and the highly flawed Religious Ed Congress. HEY, he has his undergraduate degree in accounting!!! The attacks have already begun. The editorial and several op-eds in today’s L A Times (a leftist rag) were less than flattering and less than accurate (surprise)concerning Abp Gomez. One op-ed writer hoped the Abp would not deny communion to pro-abort Catholics. Should prove very interesting come Feb 2011. This Church leader will need our prayers more than most. robtbrown: Yes, and Aumann’s book as well:<)! Thanks! If Abp. Gomez is installed next March, he’s not going to have much time to shape next year’s Religious Ed Congress, so we may not have seen the last round of foolishness in the name of the Archdiocese.